The UK’s best value Search Marketing Business. We’re online experts that have escaped the corporate world, with no shareholders to please and lower costs than our serious competitors. 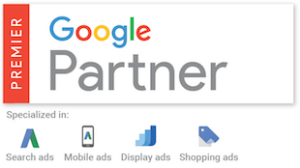 We are Google Partners which means that Google are happy to recommend us to their customers. So what are you waiting for? We will lend an ear, understand your business and give you valuable free advice. Irrespective of whether or not you become the next Searchvista client. If you feel that your website isn’t producing the business that it should be then talk to us. We’re the people to make it happen. Our team of paid search experts create and deliver exceptional strategy to insure you’re always ahead of your competition. We specialise in data driven decisions, account structure, engaging creative, boosting Quality Score and Google Shopping. Successful SEO is often about understanding what works in a given situation. It may require making small modifications to parts of your website. It may require wholesale changes. It may be that you need more inbound links, or just a few high value inbound links. We provide a bespoke Social Media Service, so it is important to work closely with you and your business in order to create a personality for your brand. We will create an authentic voice to represent you, and to interact with your customers. For local businesses it’s crucial that you take good care of how your business appears on Google My Business and via Google Maps. This is a source of free traffic and effective page development can make a massive difference to the volume of leads that you enjoy. Local SEO is specialised and quite different to the full SEO projects that we undertake. It is designed to add value to smaller businesses that operate in a distinct local area. Local SEO focuses on the helpful elements of SEO that ensure you maximise your local presence including Google My Business and Maps entries. A website not only needs to look great, it also needs to get your message across in a concise way and it needs to accommodate SEO to enable you to maximise your opportunities of higher search engine rankings, more relevant traffic and more conversions. We’ve had very positive feedback in relation to some search terms on our Explore South Lakeland website.